Today we'll be looking at the readings, the prayers of the faithful and the presentation of the gifts. Two things I like about this section of the Mass: first, the lector, before reading, asks for the blessing of the priest, which I believe (though I may be mistaken) is an element in the Byzantine Catholic rite as well. Another similarity with the Byzantine rite is the exclamation before the Gospel to "let us be attentive," which hearken to the Byzantine "Wisdom! Be attentive!" prior to the Gospel. Perhaps Anselm would know more since he frequents that liturgy. Also interesting is the way the Eucharistic elements are referred to as the Body and Blood of Christ long before the consecration, at the period when they are simply being set out on the altar. I don't know anything about this, so if anybody has any insight please let me know. 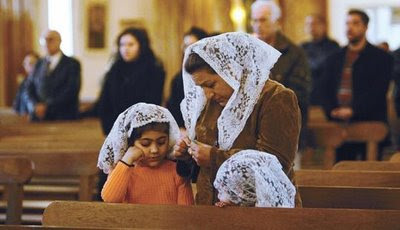 Priest: Enlighten our thoughts, O Lord and God, that we may savor the sweetness of Your life-giving and divine words; and give us through them love, hope, salvation and all the benefits needed for our bodies and souls, that we may ever sing Your praises, O Lord of all; Father, Son, and Holy Spirit, forever. Reader: A reading from the letter of St. Paul to ____________________. (Bless me Father). Priest: May Christ enlighten you with His teaching (and make you His worthy messenger for those who hear you). Deacon: Let us be attentive and hear the Gospel of the Lord. Priest: A reading from the Holy Gospel of Our Lord Jesus Christ according to __________. People: Glory to You O Christ, glory to You. Priest: Glory to God forever. People: Glory to Christ our Lord. Deacon: Let us all stand well, with joy and gladness let us implore and say: Lord have mercy. Servers: Together let us entrust ourselves to the Father, Son and Holy Spirit. Priest: We ask and beseech You Almighty God, to fill us with Your grace. May your divine mercy bring pardon to Your people and forgiveness of sins to the faithful that are chosen byYour goodness and compassion, O Lord of all; Father, Son and Holy Spirit, forever. Servers: Let us bow our heads and pray for God's blessing. Priest: Grant us in Your mercy, Lord, that together we may please Your majesty in good works of righteousness all the days of our lives, and that our service may be pleasing to You. And with the help of Your grace, may we always be worthy to offer You glory, honor, thanksgiving and praise, O Lord of all; Father, Son and Holy Spirit, forever. Servers: Our hope is in the Lord. People: The precious body and blood of Christ are being set upon the holy altar. Let us draw near, in reverence and love, and with the holy angels let us raise a joyful cry unto the Lord: Holy, Holy, Holy is the Lord, Almighty God. Priest: May Christ who was sacrificed for our salvation and who also ordered us to celebrate the memory of His death, burial and resurrection, accept this sacrifice from our hands by His mercy forever. By Your command, O Lord and God, these glorious, holy, life-giving and divine mysteries are set upon this holy altar until the coming of our Lord from heaven. To Him be glory at all times and forever. Glory be to the Father, and to the Son and to the Holy Spirit. Let us remember the Virgin Mary, Mother of God upon this altar. People: From the beginning and unto all ages, amen. Holy Apostles, and beloved of the only begotten, pray that peace be throughout the world. Priest: Let us all say "amen." Our holy patron, St. ________________, we remember you upon this holy altar with the just who have triumphed and with the martyrs who have been crowned. People: All the departed are resting in hope that through Your glorious resurrection You will raise them up in glory. That's enough for now - next time we'll pick up with the Creed and the consecration. It is interesting how towards the end (if I am understanding it right) the sacred elements are set upon the altar and the expected transubstantiation that will soon occur is referred to as a "coming" of the Lord from Heaven. This is very much in keeping with the New Testament idea of the "coming" (parousia) of Jesus as an abiding presence among the Church gathered in Eucharistic worship.